A representative will meet you at the airport upon your arrival. You will be taken to the hotel for check-in. Overnight at hotel. After breakfast, you will be transferred to airport for your flight to Varanasi. You will be assisted upon your arrival at the airport, stopping at Sarnath on the way to the hotel. 10 kilometers from the center of the city, Sarnath symbolises the birth of Buddhism. It was here that Lord Buddha revealed his doctrine and founded his monastic community. The Museum at Sarnath is amongst the most important in India and contains carvings representing a whole range of styles, from archaic to the work of sculptors from 3rd century B.C. to the 12th century A.D. In the evening, you will witness Aarti on River Ganges. Overnight at hotel. In the early morning you will go on a boat ride at sunrise on the river Ganges. This is a soul stirring experience as you witness the performance of various rituals, laundry & cremations in the background of the rising sun. We also have an opportunity to walk the narrow streets which are preserved as they were hundreds of years back in time. Following your visit, you realize why Varanasi is described as the eternal city. Later, you will take a short tour of Varanasi City, visiting the city temples including the durga temple, better known as the Monkey temple on account of the large number of monkeys residing there and the temple of Vishwanath (or Vesheshwar "Lord of the Universe"). The visit will also include Bharat Mata or Mother India Temple and the Benares Hindu University. You will then fly to Khajuraho. After you have checked in at the hotel, you will go on an afternoon sightseeing tour of Khajuraho, particularly the Eastern and Western Group Temples. Founded in the 9th and 10th Century by the rulers of Chandela Dynasty, influenced by tantrism in eroticism is a theme of philosophical interest aiming to sublimate the sexual relationship in the sexual act or "Maithun". Women are regarded as the incarnation of the divine energy or "Shakti". 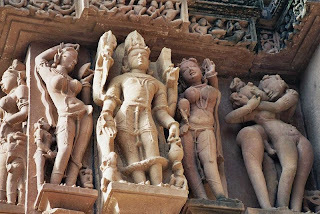 Itis also possible that the Khajuraho were influenced by "Kama Sutra". Among the temples to visit is the Kandariya Mahadeo, Chaunsat Yogini, Chitragupta temple, Adinath Temples ,Vishwanath temple and many others. Overnight at hotel. You will go on a morning sightseeing tour of rest of Khajuraho temples before driving to Jhansi for the train to Agra. En route, there will be a visit to the Orchha Temples. The Bundela chief Raja Rudra Pratap (1501-31) chose an easily defended and beautiful site for his capital. Set on the island on a bend in the Betwa River, it is elevated above the surrounding wooded countryside. Once a capital of its own state, Orchha contains three palaces - The Raj Mahal, Rai Parveen Mahal, Jahangir Mahal - each built by succeeding Maharajas in a similar style and combining to form a complex as imposing as that at Udaipur. You will also visit Ram Raja Temple & Chaturbhuj Temple. Upon arrival at Agra, you will be taken to the hotel for check in. Overnight at hotel. You will go on a morning sightseeing tour of Agra, which includes visits to Taj Mahal and Agra Fort. Agra is the city of the Taj Mahal, perhaps the most photographed monument in the world. However, no matter how many pictures you have seen or no matter how high your expectations are, the Taj never lets you down - the unparalleled glory and beauty of the building surpasses beyond all human imaginations. This spectacular monument was built for love and besides perfect symmetry in every aspect of its construction, the inlay work of semi precious stones into marble in pietra dura style is absolutely remarkable. The Red Fort began its life in the 10th century as a simple mud and brick fortress along the banks of the Yamuna River. Under Akbar (1564-1570) of the Mughal dynasty, it was rebuilt along the lines of its predecessor, which accounts for its irregular outer walls. Originally intended as a fortress, the site was partially converted into a palace during the reign of Shah Jahan, who lived in the fortress and died there - a prisoner of his own son. The outer walls, built during Akbar's time, are penetrated by two gates, called the Amar Singh and the Delhi gate respectively. In the afternoon, you will visit Sikandra. The Mughal Emperor Akbar, known as Akbar the Great, ruled an empire that stretched across North India from 1556 to 1605. Akbar's tomb is located in the serene ambience of Sikandra 3 km away from Agra. Akbar began building it during his lifetime and his son, the Mughal Emperor Jahangir, completed it. Some of its design features are similar to the design of the Taj Mahal built later in Agra. Akbar's tomb at Sikandra has a large arched entrance and green lawns, on which deer can be seen grazing, surround the tomb. At the end of the day, you will return to your hotel for overnight. On the way to Jaipur from Agra, you will visit Fatehpur Sikri. This fascinating ghost town lies a little beyond Agra the deserted Red sandstone city that was built by Emperor Akbar as his capital. It was a veritable fairy tale city and its ruins are still in a pristine condition. It is not hard to imagine what the court life must have been like in the days of its grandeur. Set like a jewel in a courtyard of pink sandstone is the marble tomb of the Saint Salim Chisti, enclosed by delicately carved marble screens. After sightseeing the drive to Jaipur continues. At Jaipur you will be taken to the hotel. Overnight at hotel. You will go on a morning elephant ride with your visit to Amber Fort, the former capital of the royal Jaipurs. Few fail to be moved by the dramatic Rajput grandeur of this hilltop fortress-palace 11-km north of Jaipur. Set on the dry wrinkled Aravali Hills, and surrounded by fortified battlements, the palace straddles two sepia-hued tundra hills overlooking Maota Lake, and its sprawling crenellated walls lattice the surrounding hills. We will ride up to this hilltop palace on a caparisoned, painted elephant, passing through the ancient main gate where Maharajas of Jaipur have entered for four hundred years. Our guide will elaborate on the history of this architectural masterpiece with its mirror-studded alcoves, dazzling mosaics and water-cooled swings that delight today's visitors as they did their former royal residents. In the afternoon, you will go on an afternoon sightseeing tour of Jaipur city. First is Hawa Mahal or Palace of the Winds, a five-storied structure of pink sandstone with semi-octagonal and delicately honeycombed windows overlooking the main street of the old city. It was built in 1799 so that veiled royal woman could peer down unseen by the world through its 593 stone screens. Later, you will proceed to a guided tour of the City Palace & Observatory. The City Palace in the heart of the old city is a blend of Rajasthani and Mughal architecture. The center of the palace is a seven storied building called Chandra Palace, with fine views over the gardens and the city. Next top the City Palace is the Solar Observatory - an astronomical treasure house, with solar device that gives accurate predictions till date. Overnight at hotel. In the morning, you will drive to Delhi, arriving in time for an afternoon combined sightseeing tour of New and Old Delhi. You will also visit Old Delhi, an ancient walled city. Here you will visit the Red Fort, Raj Ghat (the memorial site of the Mahatma Gandhi), Jama Masjid (the largest mosque in India) and Chandni Chowk, the bustling and colourful market of the old city. Overnight at hotel. You will have the day free at leisure before your transfer to airport. - Local English speaking guide during sightseeing. - Domestic flight tickets (price will vary according to seat availability at the time of booking). * This tour must be booked at least 15 days prior to the chosen departure.